After 24 hours pulled back the iOS 8.0.1, Apple has released iOS 8.0.2, a new OS update that features several other improvements and fix bug issues in iOS 8.0.1 which impacted cellular network connectivity and Touch ID. The latest firmware iOS 8.0.2 is now available as an over-the-air update for iPhone 4S, 5, and iPhone 6, iPad 2 and newer models, and the fifth-generation iPod Touch. iDevice users also can grab the update directly though iTunes. 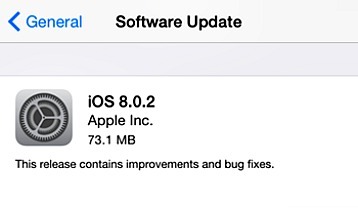 Apart from revert back to iOS 8.0, iDevice users also can update to latest firmware iOS 8.0.2. To get the update, simply connect your iPhone, iPad or iPod touch and check for updates in iTunes or navigate to Settings > General and tap Software Update.